Cosmic synchronicity: I saw you at the Perry St. Thursday Market and your tattoo really hit me with some cosmic synchronicity. I've been kicking myself ever since because I didn't ask you about the highly specific symbolism of the body art. Costco Cutie: I saw you you walking the isles of the new North Costco on Saturday July 28. You were wearing a polo and dark shades and you picked up Kinder eggs and pizza. My kind of guy. I was in the blue patterned outfit and commented about the new store set up. Maybe we can shop jointly sometime? Stung by kindness: Cheers to Erica, the kind woman who picked up a frantic and highly allergic stranger covered in yellow jackets on the Cheney/Spokane highway without question or hesitation and transported him to the paramedics swiftly and calmly on 7/28. Thank you for your unbelievable compassion and reassurance. Cheers also to the amazing Spokane Fire Department and the ER staff at Deaconess, especially Jody, Frank and Anthony. Everyone kept me smiling while I thought I was dying! Pho real: I really enjoyed our Pho date last night - July 29. It's wonderful knowing that I have someone I can count on no matter what, who enjoys the same foods and shows as I do. I am so grateful that we can share moments like that to reconnect. I love you more. Ride the goat wave: Last weekend at the closing of the Observatory (RIP) I was meeting up with a total babe for your show. She arrived to the venue and bailed before you guys took stage. Rather than being heartbroken my stoke was unphased as I waited for my favorite rock duo electrify a packed venue once again! It wasn't until I got home I even thought about how she dipped pre IG. Even then I was riding the energetic wave of the concert. Thanks for the killer night! Our wonderful bus drivers: Cheers to the wonderful bus drivers in Spokane! They put up with a lot of crap, yet they greet us with a smile on their faces and when you leave the bus they always wish you a great day - even if it's snowing, raining, or you yourself are having a crappy day. They're waving to fellow bus drivers and I think that's awesome. Being a bus driver is hard work and I have a deep respect for them. You Got This Girl!! "Grasshopper/MSF, I know that life has been dealing you a lot of tough stuff... I am here to tell you that YOU'RE KILLIN' IT! 1) All A's and B's as a Freshmen at Eastern (Check) 2) Cozy 1 bedroom apartment (Check) 3) Beyond beautiful and precious daughter(check) 4) P/t job at KFC (check) Love you always - JSF"
Conservative Cathy: Your hate ads aimed at your opponent make me wonder what you're hiding. Using "liberal" like a four letter word is childish. She's liberal so she might help those other than rich white people? (Yes, I'm white). Try running an honorable race, and watch out for those "dangerous liberals!" 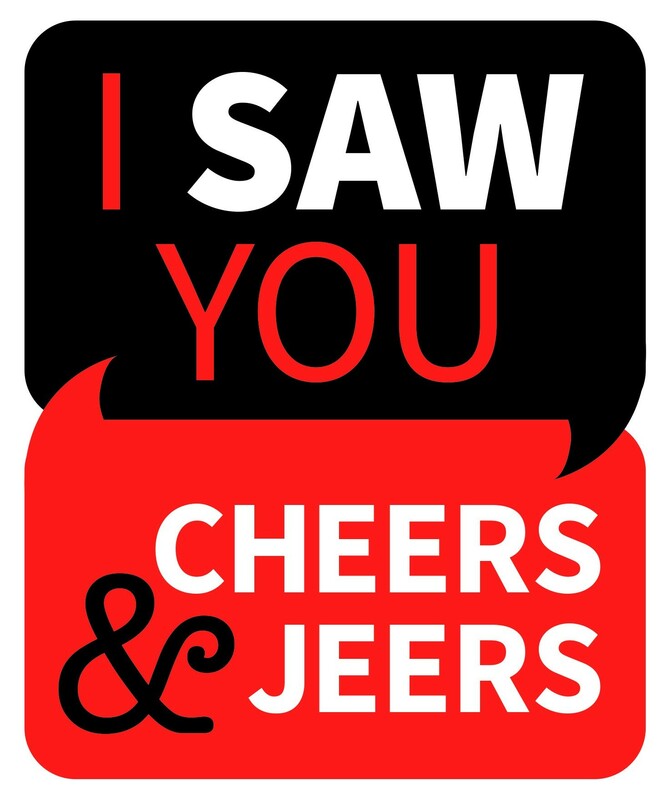 Jeers to everyone on the road! : Drivers, jeers to you for turning through crosswalks before pedestrian's are through! Cyclist, jeers to you for acting like traffic laws don't apply to you i.e., a red light means STOP! Pedestrians, jeers to you for staring into your smartphones oblivious to traffic. And jeers to jaywakers who know that the police won't cite them and to red-light walkers just to list afew. I see why we've had so many driver pedestrian/cyclist accidents. Sticky fingers: To all those Trumpanzees out there who feel compelled to keep stealing my Lisa Brown signs here in Colbert, I suggest a better use of your time would be to research Ms. McMorris Rogers congressional record for the past 14 years. Do you really feel your needs/interests are being represented? Besides, when you steal my sign on a Sunday morning you make the baby Jesus cry. Shade where it's needed: Sunday, July 29, 1 pm Northwest Blvd Safeway, white GMC pickup with a black bed liner parked on the far west slot in front of the store. 91 degrees with no shade in sight and your sweet brown dog in the back of the pickup. I went into the store and when I came out he was panting as hard as a dog can pant. I wrote down your license and reported it to Safeway. I had to leave as I was picking up my mother at Walgreens. I came back and the information lady was verifying the info I had written down. I told her time was of the essence and she needed to get on the microphone soon. What is wrong with a person who would leave an animal in 91 degree heat with no shade? At least he wasn't in the truck... I would have broken a window to get him out. Are you really that clueless? PLEASE for the sake of all things holy. Do not leave your animals to suffer in this heat... NO WHERE, NO HOW. He was a sweet little dog who was needlessly suffering because you left him to suffer. I hope you see this jeers and learn something. Heatstroke at the show: Jeers to a popular music venue for a sweltering experience last Sunday night. It's no fun to have sweat running down your back from simply standing and listening. God only knows how hot it was under the stage lights. I won't be back for a summer show ever.